It's harvest season! That means I have a bunch of pumpkin kicking around the house, I love pumpkin and pretty much all other orange vegetables. I've been making lots of pumpkin soup with the slow cooker. I love it and it is a very versatile soup. Did I mention that the kids absolutely love it? Start off with a small saucepan, add a tablespoon of coconut oil (or another vegetable oil/butter of your choosing,) 1 medium diced onion, 2 - 3 cloves of garlic and if you like celery feel free to throw in a couple diced stalks as well. Cook until the onions and celery soften and then add the mixture to the slow cooker along with 3 cups (750 ml) of chicken broth. I used "Not Chick'n" cubes to make the broth, they are chicken cubes for vegans and are made with some top quality ingredients. Add 1.5 cups of pumpkin or squash puree, half a cup of carrot puree, some finely diced kale, a small garden tomato (if you have one on hand). Now, to thicken the soup add about half a cup of heavy cream. It really is optional though but it does taste better with the cream. You may add milk instead or opt out all together if you don't eat dairy. As for the curry seasoning, everyone has different tastes... I add about 3 tablespoons, you may choose to add more or less. Leave it cooking on high for at least 4 - 6 hours or until it reaches it's desired consistency. We like it thick in this house but some people like it soupy, if that is the case add a little more chicken broth or cream. I've been a busy bee blanching Kale, Carrots and other veggies to store them for the winter. Blanching vegetables are really easy. Boil some water, place the diced veggies that you want to blanch in the water for a short cooking time (depending on what is being blanched) and then remove the veggies from the boiling water and place on ice or under cold water essentially shocking it to halt the cooking process. After it has cooled, you bag it in date marked, portion sized, freezer-safe bags and your all set to enjoy your favorite veggies in your favorite recipes. 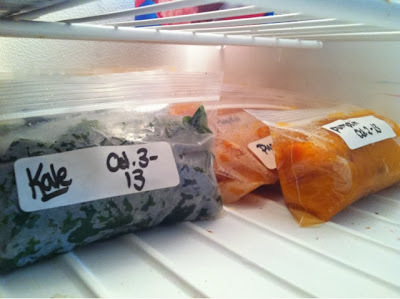 I also make pumpkin/squash puree and pie mix and freeze them in date marked, portion sized, freezer safe bags. It is very convenient and is going to save me a lot of time when the holidays roll around.